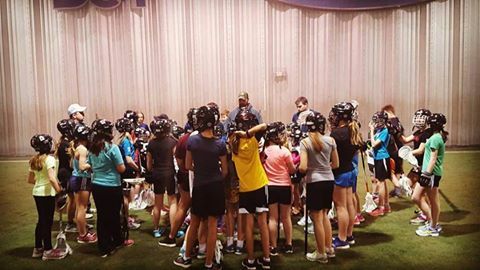 Every year our girls lacrosse program continues to grow as more and more girls realize the many benefits of playing box lacrosse. This program allows female players to increase their fitness and coordination, improve their mental acuity and health, develop friendships and socialize with other girls, all in a positive atmosphere that emphasizes fun, fitness and teamwork. Due to the fewer numbers of players registered in our girls lacrosse program, girls who want to play competitive lacrosse are also required to play in the girls house league program. Box Lacrosse consists of boys and girls playing on the same teams up until Novice age, and then there are all girls teams offered. To form the girls house league program, players are evaluated and sorted into balanced teams at the start of the season. The season runs from early April until the end of June, and consists of one skill developing practice and one action packed game per week, typically on Monday and Wednesday evenings. Our goal is to adhere to this schedule as much as possible but inevitably there may be conflicts, and occasionally a game or practice may need to be on a different night of the week. The regular season is followed by an exciting playoff series. Forming girls competitive box lacrosse teams is dependent on numbers of girls interested. The competitive season is longer, running up until the lacrosse provincials in late July or early August. Competitive players get an additional practice (outside of house league) a week and play zone games, 1-2 tournaments, out of zone fun days and provincials. Historically the Nepean Knights has had a bantam/midget girls competitive team but we are always interested in forming more competitive teams, especially at the younger ages.